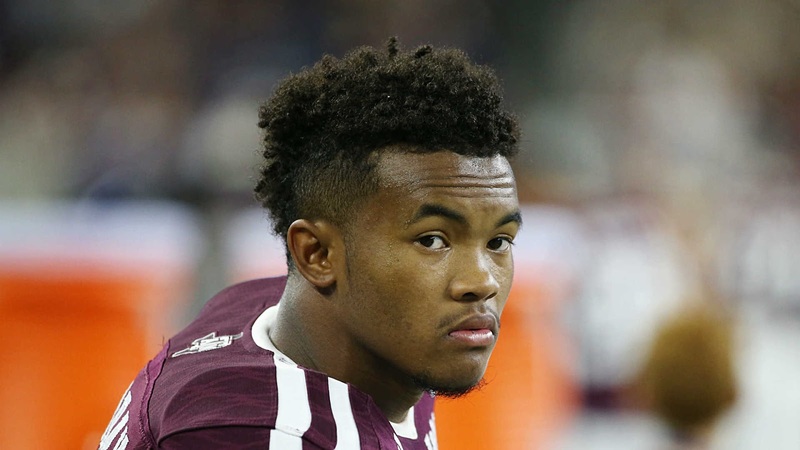 Shirts With Random Triangles: Kyler Murray Is An Oklahoma Sooners Quarterback. A statement released by the school stated that Murray would "join the Sooners' football program starting with the 2016 spring semester." Oklahoma head coach was quoted in the statement as saying "We're very happy to welcome Kyler to our program and we look forward to working with him." Murray's family announced last week that Murray has asked for and been granted his release from scholarship from Texas A&M. It was part of a massive one-two blow to the Aggies football program, as Murray's fellow QB Kyle Allen announced his plans to transfer to another school on Dec. 10. Both Murray and Allen will be ineligible to play in 2016 due to NCAA regulations on transfers.